A lively and informative guide, Right Time Baby dispels many of the outdated myths concerning older motherhood and gives useful advice for increased fertility and a healthy baby. Conceived as media-friendly and easy to digest, it hits the Zeitgeist and empowers later mums rather than adding to their anxiety. The past ten years has seen the conception rate for European women over thirty-five soar. This trend is international and increasing as we get healthier. The subject is rarely out of the news with many celebrities having children later. Women today postpone childbearing due to higher education, pursuing careers and enjoying their independence. They also spend longer looking for the right partner. Packed full of useful tips from top medical experts, scientists and world authorities, including Ina May Gaskin and Dr Marilyn Glenville, this book is a complete guide for the woman who’s lived a full life before giving birth. 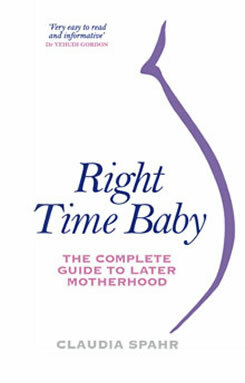 Right Time Baby is an intelligent, entertaining book aimed at inspiring the biggest transition of any woman’s life.
" Very easy to read and informative." " Claudia Spahr has written a wise, informative and entertainingpregnancy and birth guide that is perfect for both older mothersand equally relevant if you’re still in your teens or twenties. Don’t missthis one!" " At last a book that puts the risk factors into perspective andencourages older women to become mothers! Claudia Spahr offers atreasure trove of useful guidance about the wonderful options there arefor a positive and life-changing pregnancy at any age. Written with atwist of humour, this book will inspire and inform as much as it willamuse you. " " I’m glad there’s finally a book I can hand all the terrified women who come to me in their thirties. Right Time Baby is just the right medicine for women who want to have a baby but who have been led to believe that their fertile time is drawing to a close. Nothing could be further from the truth. Take heart, read this book and tap into your fertility birthright. " 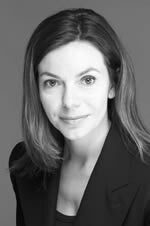 " The book by Claudia Spahr is perfectly adapted to our time because many sentences end with a question mark. Delayed motherhood is an unprecedented situation on the five continents. When facing new situations the priority is to phrase new questions.– "
" This book gives women a timely and positive understanding that pregnancy over 35 is not just a possibility, but a source of joy and delight. Claudia offers oodles of useful tips and helpful information, presented in a really accessible and down-to-earth manner. A fabulously helpful resource." " The time is right for a book like this. I shall be recommending Right Time Baby to all my pregnant clients. "